Rather than taking online surveys for PayPal payments or Amazon gift cards, you might be looking for something a little bit different. If you’re interested in receiving coupons in exchange for participating in free online surveys, we’ll show you just how to do this. Coupons exist for thousands of different products, and the types of coupons you can receive for taking surveys will vary. Most however, will be for things like grocery purchase, makeup, toiletries, to fast food restaurants, and more. As well, you might also be lucky enough to receive samples of products of things like dishwashing soap, detergent, hand cream, etc. 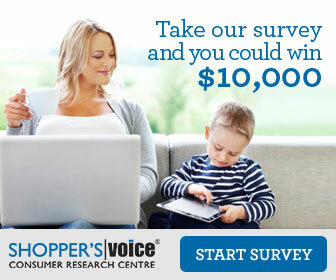 Shopper’s Voice is a unique program that enables Canadians to receive customized money saving coupons, offers, and surveys. Participating begins by taking an approximately 20-minute-long survey which will be used to understand your shopping preferences. Based on your responses, you will receive tailored coupons, discounts, and other relevant information. Not all members receive the same offers – people living in Western Canada for instance might receive different packages than those living on the East Coast. As well, you might receive different packages if you’re male or female, are the primary grocery shopper, have expressed interest in cosmetics, etc. You will have the opportunity to take this long survey a few times a year, after which you will be sent subsequent packages of money saving coupons, discounts, etc. You’ll receive these in a package/big envelope which will be mailed to you and will contain all these goodies. As well, you may also receive special emails from Shoppers Voice sponsors which include even more coupons and other special offers. These offers and coupons will have to be printed out in order to take advantage of them. You can opt out at any time.